Three weeks prior to the Dorset Invader Marathon, Film My Run was in the pretty village of Sidling St. Nicholas, to the run the now iconic Giant’s Head Marathon. This was voted Best Marathon in the UK by readers of Runners World magazine in 2015. My film of the event prompted the Race Director Andy Palmer to invite us back to run the next White Star Running event. I do like Dorset. My wife comes from Dorset and we regularly travel to visit relatives. It’s arguable which county on the south coast has the most beautiful scenery. Sussex is stunning and I’ve always loved Devon and Cornwall, but Dorset is right up there too. 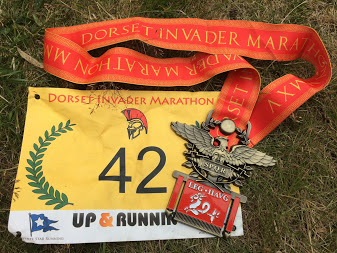 So it really was a no brainer to travel back to run the inaugural Dorset Invader Marathon. As with Giant’s Head the distance would be something around about 26 miles and more like 27. The thing is, no one really cares. Let’s just run across the hills and see where we get to. At 5:30am Richard arrived and we duly made our way along the A27, M27 and A31 towards Dorchester. 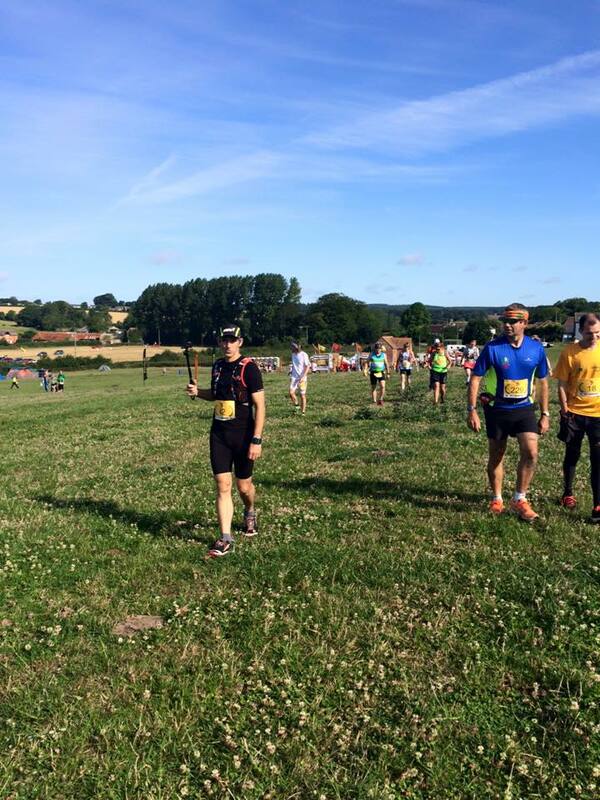 The race start was at East Farm not far from Blandford and we arrived in good time on another beautiful sunny day. One thing that is apparent from the outset at a White Star Running event is the organisation and planning that has gone into it. Everything is clearly signposted and well laid out. Plus you just get that little bit extra that you may not find at other events. You don’t just get porta-loos, but porta-showers too, with hot water. You don’t just get a few drinks on a table to purchase, you get a fully stocked bar, a hog roast and a proper sit down cafe with porridge and real coffee. There’s a merchandise shop, a massage tent and even a chiropodist on site. 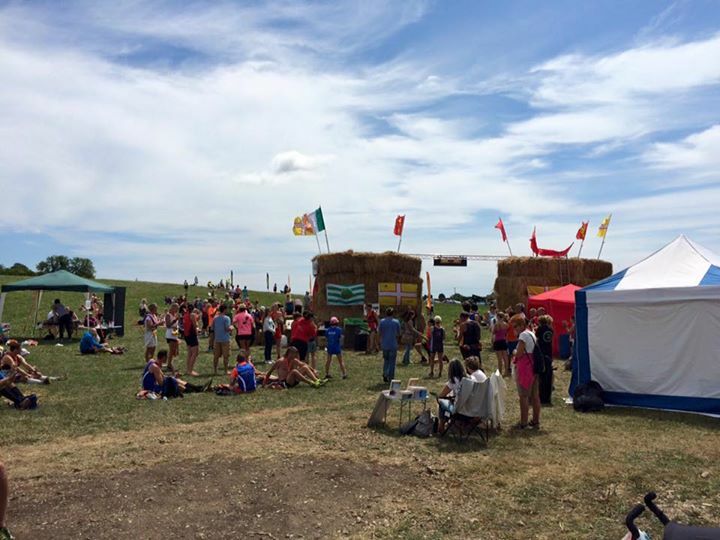 Furthermore, given the weather and the theme of the event (Invader=Romans), there was a Roman Bath; a rectangle of hay bails covered with a huge black tarpaulin and filled with water. The finish line was made with hay bails and for those who wanted it, there was camping available on site. Other race organisers take note. This is what you can achieve with a modest £30 entry fee. To be honest, I don’t know if White Star Running are making any money but they put their heart and soul in to ensuring that the runners at their events are looked after, made to feel welcome and given a great day out beyond the run itself. Remember, running is social and running events like these should be social and inclusive. They should encourage families to attend to enjoy the day with the runners. Because we arrived so early I spent quite a while filming and as a result I managed to drain the battery on my camera significantly before the race even started. I was a little worried it wouldn’t last me until the end. We ate porridge, drank coffee and pinned numbers to our clothing before making our way up the hill to the start. Although the race is chip timed, there is no timing mat to run over at the start. Rather, everyone gets the same start time and you run over a mat at the end. The Giant’s Head Marathon began with a wedding proposal and the blast of a hunting horn from a lady on horseback. The Dorset Invader Marathon began with a procession of folk in togas and full centurion uniform and another horse with rider in Roman armour leading us off. Makes a change from a lead bike! Richard said he wasn’t going to go off fast but he was way ahead of me by the time we got down the hill. As much as it is nice to run with someone, I decided to run my own race. It’s something I would come to regret a little as the race went on. What was immediately apparent about the Dorset Invader Marathon route as opposed to Giants Head, was the elevation. We didn’t run a significant hill until just before half way. It was undulating yes, but nowhere near as challenging as Giant’s Head where the first hill comes after 400 metres! The route is also not quite as picturesque as Giant’s Head. But then, it’s Dorset so, “not quite as picturesque” is still pretty darn impressive and you’d have to go some to beat Giant’s Head anyway. While we are on the slight negatives. 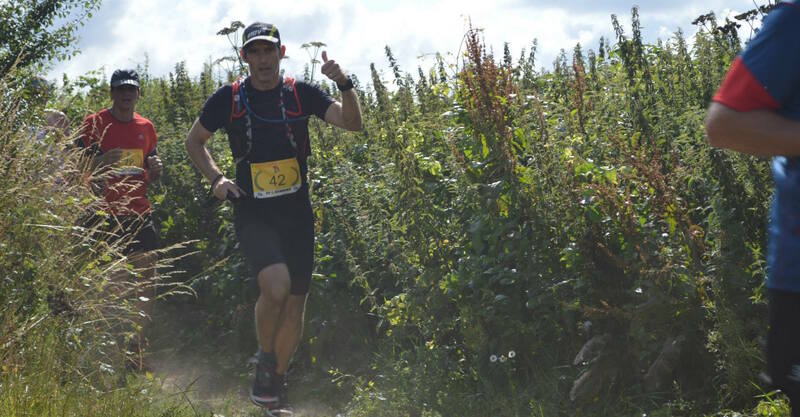 There weren’t quite as many runners in the Dorset Invader Marathon and although my film makes it look like I was running with people all the way, there were quite a few sections of the race where I was on my own and it did feel a little lonely out there at times. That said, it really wasn’t that bad, I’m a big boy and I can cope on my own! Also I fell over for the first time in ages. There was a chap ahead of me at one point who was shouting out a warning whenever he came to a potentially hazardous bit of terrain and even with this I still managed to miss a tree route whilst fiddling with my camera. Cut my hand, knee and elbow but saved the camera! Despite the route being much easier than the Giant’s Head Marathon in terms of elevation, I found the Invader pretty tough. I think for a number of reasons. Firstly, I ran 9 miles just two days before so my legs were a bit tired, plus I’ve not been so diligent with my low carbohydrate regime since the Viking Coastal Marathon in June and I think my body may be slipping back in to carb burning over fat burning. I’m not too worried about that at the moment as I’m not currently trying to get PB times, but I need to be aware that it will impact me in races like this. I may also have had a little too much to drink on the way round. I should stick to my water rather than grabbing coke and juice from the well stocked aid stations! 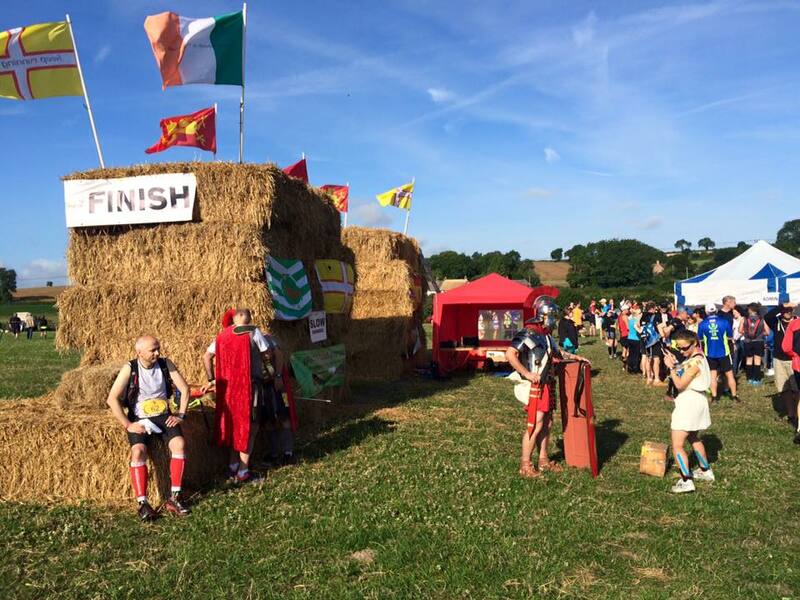 Most of the aid stations were manned by folk dressed in togas and other Roman get-up. They were filled with cake, biscuits, melon, orange segments, jelly babies, crisps, water, Coke and juice. 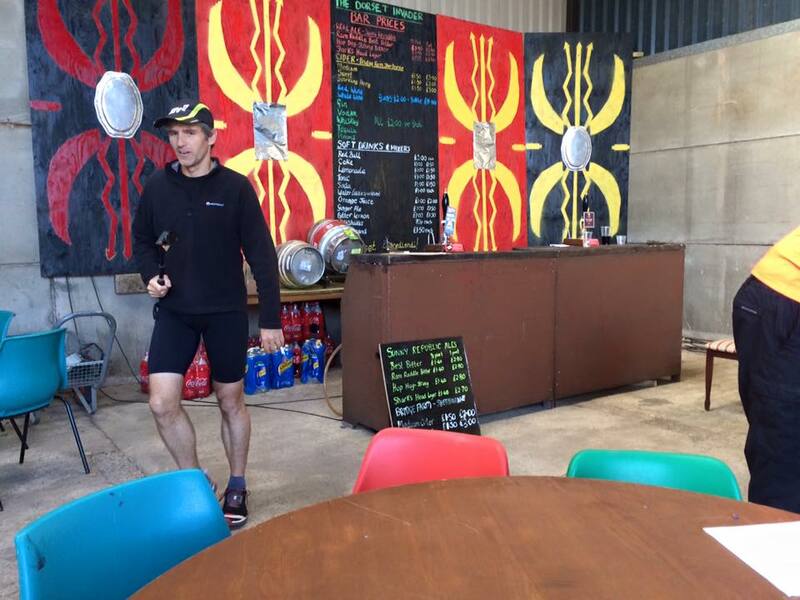 The only other aid stations I have loved more were at the Beachy Head Marathon where they served tea and coffee at two of the stops. That was awesome. I managed ok until around 17 miles and then I started to feel it. It was warm and I could feel myself flagging. I was still chatting to various people as I went round. Some I had met in other races which seems to happen at increasing regularity. I suppose this is not much of a surprise though. There are only a finite number of races in the areas of the country where I run and there are a finite number of regular runners of these races. There are then fewer runners who run at around about the same pace as me. So it stands to reason that I will come across the same people time and again. It was noted at Giant’s Head and again here, the signs which greet you on your way round. “Blessed are the cheesemakers”, “Infammy, infammy, they’ve all got got it in for me” and “Hurry up FFS” being a few that spring to mind, as well as the sign at the bottom of a hill simply reading “Up” with an arrow in said direction. 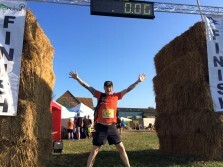 I was very glad to finally emerge from the woods at the top of a field with the finish in sight. At 4 hours and 12 minutes my time was 20 minutes faster than at the Giant’s Head Marathon, but it felt slower. Richard finished in 3:50 and came 8th overall. I was determined to brave the Roman Bath which, despite the heat of the day was still very cold. I really enjoyed the dunk though. 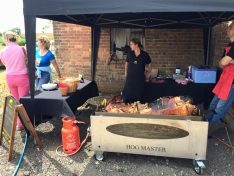 Richard tucked in to a hog roast bap, despite saying he wasn’t hungry and I stuffed my face with ice cream and more Coke-a-Cola. There was a marriage proposal at the start of the Giant’s Head Marathon and there was then a marriage proposal at the end of the Dorset Invader Marathon. What’s the matter with these people?!! Whatever happened to proposing on top of the Eiffel Tower or on a gondola in Venice? Sort it out people. The battery on my GoPro latest, just. It finally died as I was saying my last little bit to end the film. Mental note to make sure I always carry a fully charged spare battery at al future events. I’ll probably need at least three batteries for Grim Reaper. 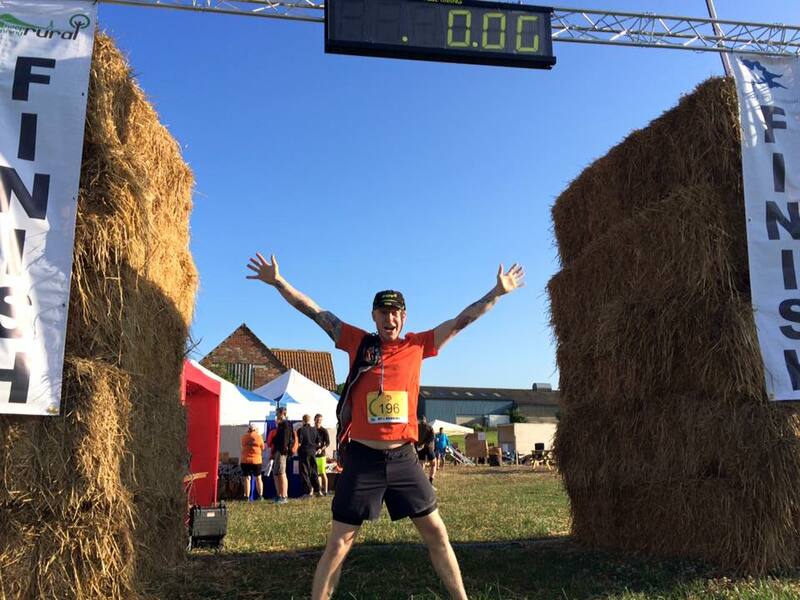 Talking of that, as part of our training for the Grim Reaper 70 mile ultra soon, Richard was doing another marathon the next day. I, on the other hand, had already booked to do a 10k race in the Olympic Stadium and then do a children’s race with my daughter. If the Dorset Invader Marathon did anything, it reminded me not to take marathon running for granted. Some runs will initially look tough, but will turn out to feel relatively easy. Others will look easy on paper and will really take it out of you. Today was a bad run for me. I didn’t feel as good as I have come to expect in a marathon. But that’s not to say I didn’t enjoy the day out. I loved it. I loved the weather, I loved the countryside, I loved filming and chatting to people. I loved the exhilaration of starting and the relief of finishing. Marathon running is awesome. Trail running is awesome. In the words of the song…”everything is awesome’. One final thing, the medal is possibly the biggest medal I have ever had from a race. It’s a good chunk of metal. Thanks again to White Star Running for inviting us to run and for organising another lovely race. We will be back.